Given they were one of the earliest adopters of the now ubiquitous XPA title for one of their beers (their first, no less), we shouldn't be surprised to find Wolf of the Willows potentially angering traditionalists by being one of the first locals* to bring another new "style" to the Aussie beer scene. This time it's the subtitle given to the returning Acidulus II: New England Sour. So what does it mean? 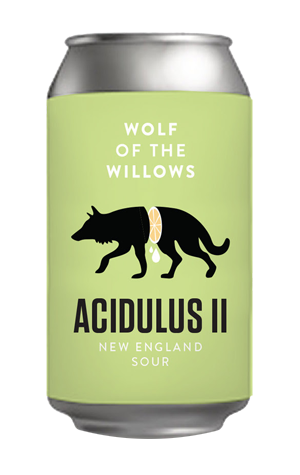 Firstly, it continues their fondness for a dead language: Wolf of the Willows is derived from a Latin name for hops; here, Acidulus is an adjective derived from a Latin term for sour. And, in the case of Acidulus II, the beer is a hybrid of highly hopped and typically hazy New England style ales and a soured ale. The New England side of the beer comes from the inclusion of wheat and oats plus a heavy dry hopping regime during fermentation featuring Enigma, Citrus and Mosaic. Thus you'll pick up aromas of citrus, while the oats give the beer a smooth texture. Lactobacillus and the unique yeast strain they used in last year's soured blonde ale Acidulus contribute the beer's sour and tart qualities; taken together, it makes the beer reminiscent of a tropical fruit bowl laced with pineapple and mango.